Challenging, in gorgeous wooded park with water. 4 holes incorporate water. US 131 to 28th St. exit. West 4 lights to a right on Byron Center Rd., then left on Porter (4 way stop). Park is on the right. Although this course is only nine holes it does provide a challenge. There is water that comes into to play on holes three, four and nine but it can be avoided fairly easily. 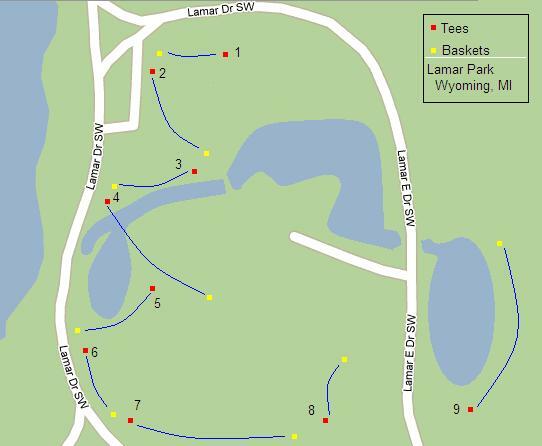 Also on hole four make sure not to throw onto the baseball field as there is no opening in the fence near the course. Most moderately skilled players should have no problems. Very nice park.